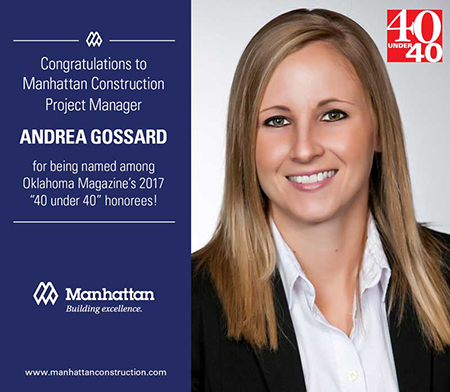 We are thrilled to announce that Manhattan Construction Company Project Manager Andrea Gossard has been selected as an Oklahoma Magazine “40 Under 40” Class of 2017 honoree. Each year Oklahoma Magazine recognizes 40 young professionals who are making a lasting mark in their home state. During Andrea’s career at Manhattan, she has been involved with constructing more than $260 million in projects in Oklahoma. Andrea is currently serving as project manager for the highly-complicated, top-to-bottom interior restoration of the Oklahoma State Capitol. This project team has developed the first-ever building information model (BIM) for the Capitol integrating the design, mechanical, plumbing and electrical systems into a 3-D format. In 2016, Andrea was named “Project Manager of the Year” by the Associated General Contractors of Oklahoma. In 2013, she was named an OKBiz “Forty Under 40” honoree. She has served on Manhattan Construction project teams whose work has resulted in five Associated Builders and Contractors of Oklahoma Excellence in Construction Awards (2014, 2013, 2012, 2009 and 2006) and two Associated General Contractors Build Oklahoma Awards (2014 and 2012). Andrea received her Bachelor of Science in Construction Science from The University of Oklahoma in 2008. During college she interned with Manhattan Construction from 2006-2008 and after graduation became a full-time team member at the Company. You are currently browsing the Manhattan Construction Group blog archives for April, 2017.